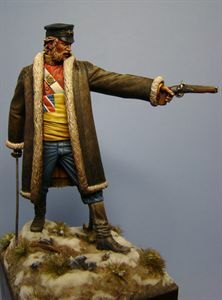 This is one of our recent release at Euro Militaire 2013 sculpted by Mike Good and is a 90mm figure of Lieutenant Souter at Gandamak. The box art has been painted by Eddy Vandersteen. There is some conflicting information concerning Souters rank as a number of source have him down as a captain at the battle. But the regimental records show that he was promoted to Captain in October 1842 and the battle took place in the January of that year. The kit is now available in our shop here.